The last several years the hubs and I have been very conscious about all the unhealthy products and additives in items we use and eat. I was so aware of everything around me when I was pregnant and realized if it matters while I'm pregnant it should probably just always matter. When doing research it's so scary all the dangerous ingredients that are in household cleaners like formaldehyde, a known carcinogenic, phthalates, known to affect human reproduction and development, and the list goes on and on. And don't get me started on all the additives in foods we eat, that's another post for later. 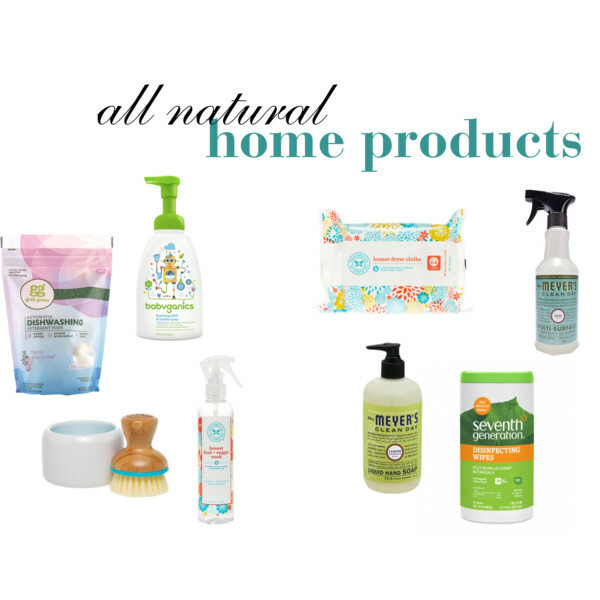 I thought I would share a round up of some of our favorite all-natural home products. I am so thankful that our selection is getting bigger and bigger and that companies are finally starting to listen to consumers. It is definitely more expensive to buy more natural products and organic foods but the trade off in the end is huge. Dishwasher pods-we love several different all natural dishwasher pods but the scent of these have been our favorite. Switching to organic dish pods has been our newest switch but I really started thinking about washing all my dishes in unsafe chemicals and decided it was time for the switch. Fruit+Veggie wash|Scrubber-We love ALL things Honest company. Their diapers and wipes were our first favorites and I am SO thankful that they are continuing to expand their line. This fruit+veggie wash and scrubber are must haves. I use them all the time. I just throw all my fruit and veggies in the sink and give them a wash before throwing them in the fridge so I know they are clean when we are ready to eat. Dryer sheets-Another Honest company favorite. There are SO many awful ingredients in dryer sheets so I have avoided them for years but when Honest came out with these I knew I had to have them. I don't use them for every wash but throw them in on occasion. Disinfecting wipes-these wipes get an A+. I love, love disinfection wipes, I am the queen of disinfecting and love being able to just grab a wipe for a quick clean up. They are non-toxic, ammonia, phosphorus, phosphate and bleach free. Surface cleaner-Not only does this cleaner smell fab but it doesn't leave any residue and is obviously all natural. I love every scent Mrs. Meyer's has created so far and they are all natural and made with essential oils. Hand soap-I have these all over the house. SO good. The scents are so perfect!